Change – you either love it or fear it, but its going to happen. The angels remind us to embrace it as a gift, and I share some thoughts on how to do so more easily. Take a breath while we embrace you with our love. Release your tensions, fears, upsets, anxieties and stress. Breathe in with us. Now release. The energy is circulating swiftly upon your planet. In many cases, it is bringing up old fears, old issues, and things you though you already dealt with at much deeper levels. One of the greatest fears upon your planet is the fear of loss. "What if I lose my boyfriend, girlfriend, or spouse? What if I lose my child? What if I lose my job? What if I lose my home? What if I lose my health? What if...?" These fears, based on the earthly world of illusion control you in many ways. Truth offers freedom. There is absolutely nothing in this world of form that lasts forever. For many of you this brings up fear, yet the impermanence of form is one of God's greatest gifts to you. Can you fathom living the same life, with the same possessions, under the same circumstances for eternity? You would go crazy with boredom for it is the nature of the soul to create. Can you imagine playing the same role, in the same persona, for eternity, never having the chance to start fresh and try on new perspectives? Can you imagine having to stay the same person to please the same people now and forevermore with no room to grow? Dear ones, changes are what allows your spirit to expand into a greater awareness of your true nature. Through change you witness the many forms and faces of the Divine, for every living being, every inanimate object, every blade of grass, every mountain, every animal, is simply an embodiment of the One love. As you look into the mirrors of creation, you gain a greater awareness of the true Self within. The windows into the Divine will change throughout your lives but the One behind them remains constant. People may come and go but the Divinity that animates them can never leave you. Things may come and go and yet the love that lives within each tiny subatomic particle, and the life-giving principle which arranges them can never leave you. The very love that animates all of creation is One, peering at you through countless eyes, made manifest in oceans, trees, breezes, mountains, and the smallest single-celled animals. In every thought and every breath there is only One love. Your soul will feel great freedom if, instead of fearing change, you embrace it wholeheartedly. Trust that change is the result of your growth – individually and/or collectively. Trust that your changes, when embraced with love, ultimately lead to a more conscious and happier life. People who no longer match your expanded awareness may leave or fall away from your life. Expect new, compatible people to be drawn to you. Loved ones may die to their earthly forms. Expect their expanded spirits to work with you, guide you, and love you as you continue your journey here upon the earth. Things may break. Expect new, better, more convenient things to be drawn into your life. Jobs may come and go. Understand that you have outgrown them and you will be guided to better. You will inevitably lose things, people, jobs, etc. You will gain and release money. You will have thoughts come and go, beliefs you espouse may change.Even who you think you are will both contract and expand throughout your life as you continue along a gradual path of awakening spiritual awareness. Change is the nature of life in your three dimensional world. Instead of "hanging on" to the past, grieve if you feel sad, embrace the changes as best you can, and expect that – because of the expanding nature of your soul – you will find even greater expressions of love working their way into your lives. Change is inevitable. Love is the Constant. "I can never lose the One that lives in all souls. I can never lose the Love that lives in creation. The forms may change, but the One Love I seek in all things and all beings, is and always will be mine to keep." This truth, dear ones, will never change. Video - "Awaken Your Healing Energies & Be Healed & Uplifted With The Angels"
I have had so many changes in my life I can't count them. I moved across the country after college to get married. I gave up a lucrative engineering career to talk to angels. I moved away from my entire life when I figured out who I really was. I lost all but one friend. Throughout my life these cycles of change have occurred time and again as I grew. I've seen this with clients and friends alike. One particularly common thing that happens as we grow is that people in our lives who are unwilling to grow with us and no longer compatible with who we've become can fall away. When I learned boundaries, the ones that didn't have any got mad and left. When I grew into greater self-love, the folks that expected me to make up for their lack of it, fell away. When I grew into greater self-care, those that had demands upon my time got angry and left. I have come to humorously call these periods of intense growth and change, "Self Cleaning Cycles." As we grow, those things and people which no longer suit us naturally leave our lives. I've written about this before. In late 2009 I had a strong urge to pray to live. Psychic friends called to see if I was "OK" even though I was in great health. Other friends mysteriously started checking my car tires and told me to get new ones. I did so. A few weeks later I had two very near misses, which would-have-been-fatal car accidents, if something hadn't helped me veer suddenly out of harm's way. I was so unnerved I got a reading with Summer Bacon – a fantastic trance medium. I didn't say a word about what was going on. "Congratulations," the angel boomed out through her voice! "Before you were born you decided you'd die before your 46th birthday but you've changed your mind and decided to live." I burst into tears. I knew it was true. The following year, nearly every appliance in my house broke, a window shattered, the roof needed repair, and the list of repairs goes on and on. "What on earth is going on?" I asked the angels. "Your house thought you were going to die. The old vibrations are falling apart," they answered! Good lord, I intentionally put a stop to that! Likewise as I've grown people have left my life, often dramatically. When I quit engineering a best friend angrily demanded that I explain, "how I could leave her," forgetting that I wasn't dying. I know so many of you have gone through this too. We simply become vibrationally mismatched. It's "grow or go" here upon the earth... If you don't grow together, it can't last forever. However something magical happened too. I made peace with change. Now I have delightful friends who grow with me. When someone occasionally leaves upset, I wish them well. I've made peace with loss (I still grieve) but it enables me to talk to people and pets much more quickly after they pass on. I made peace with the fact that cherished possessions sometimes break and even if I grumble a little about the inconvenience, I know I'll happily find new ones. There are many times in my life where change brought me more joy than I ever dreamt possible. People left and I discovered in turning to God that I found a joy no one can ever take from me. The day the folks that originally live streamed me had computer issues was the day I was forced to figure out how to livestream my gazes on Facebook... a change that brought me closer to so many of you in ways I couldn't have imagined. Change, whether we think we want it or not, brings opportunity to seek the love beneath all things, and in so doing, we gain a strength and clarity that inevitably brings better and enriches our lives. 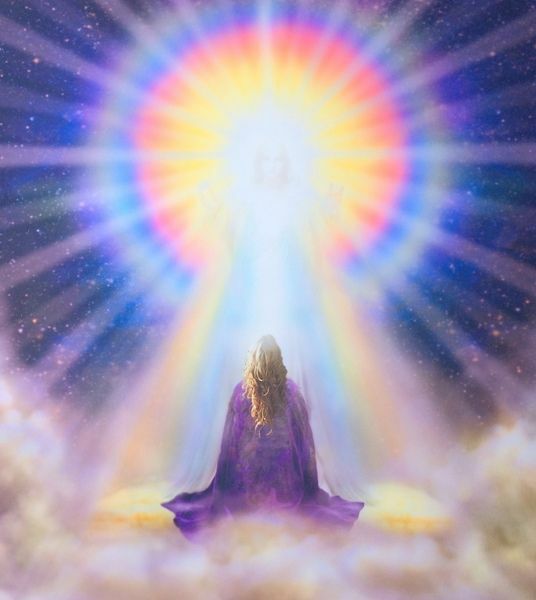 Video "Judy Satori's Meditation Of Light From The Multi Galactic Diamond"
Change will happen. Rather than fear it and mess up your present moment, squeeze the juice out of life right here and right now! Love and enjoy the people in your life now rather than fearing their loss. Enjoy your body now rather than fearing its decline. (Fear causes decline!) Enjoy the money you have now, with gratitude, knowing a mentality of abundance will keep it coming, even after temporary periods of lack. I was once crying as I was hugging a friend who was going to leave. "I'm going to miss you." The angels got in my head, "You're missing him now! You're missing out on a moment of love!" OMG! So true. I quickly shifted to enjoy my remaining time with this person. As you practice the art of enjoying what you can, right here and right now, you become aware that your happiness is a choice that is not dependent on external circumstances. Loss will lose its ability to terrify you. You get to choose your joy, no matter what the outside world does. When change comes, embrace it as best you can. You may have to grieve. I have. You may resist and get angry. Been there. You may feel victimized. We all have fallen into that mentality at times. However, as soon as you find a moment of peace, breathe, and remind yourself... "Trust everything. Earth is a school. Life is a dance. Change gives me opportunity to seek the greater love beneath it all." If you lose a job remain confident the universe is guiding you to better. If you lose money, learn from it. If you lose a dear one from the earthly plane, remind yourself that you can continue the relationship with them. It will just take an effort to create an expanded level of consciousness. You can do it. If you get diagnosed with and illness, assume your soul is calling you to greater life and well being. Start looking forward to the changes you will make as a result of, and beyond the illness. This has healed me many times. Change is calling you to embrace a deeper understanding of life, love, and happiness. We were born to grow. Look back over your life at some of the bigger changes and see how they have caused you to grow, expand, and seek a more loving experience of life... even if you had great resistance at first. Bless those who catalyzed the change, even in the most unthinkable and ungraceful ways. As well as your inspiring people, the difficult catalysts are also the spark plugs that get you going and growing. If you wish, pray, "Dear God, I trust this change is in my path to help me see how I have grown or to catalyze my growth. Help me embrace it with trust and faith, knowing I am loved beyond measure, guided, and that your only desire is to reveal yourself to me in ever changing ways, in ever changing forms. Help me find and feel the love beneath it all." Change can be scary or it can be exciting. It can create fears of doom and gloom or it can inspire a joyful sense of adventure and anticipation as we face the glorious unknown. After all, it is only in the unknown that we open ourselves to beautiful experiences that we, with our limited minds, could never even imagine. Reunited with all the lost Souls, you are finding your way Homeward. You now recognize that your greatest strengths are the parts of yourself you have never honored or respected. It was usually because these aspects were not appreciated by the world, so you drew inward in fear. Perhaps even in shame. But the world has changed as the consciousness of humanity has expanded. The new living frequencies of Light have created a fertile field to plant the seeds of your most precious gifts into the Garden of your Soul. Your highest soul’s reality that you came here to live is now unfolding even as you step into portions of life you were not expecting. The Great Unknown of the future can be kind and bless you in ways you had not imagined. Creative Solutions abound! As such, you will require discernment to open the doors that you see unlocked so you can let the sun shine into your life. This Light allows your Soul’s gifts to blossom, often shining through the heart that is breaking, even as it opens to Divine Love. For your new Soul expression was meant to be. Know that new freedom is at hand. This Equinox balance will bring new traditions forward. Traditions that honor your unique Soul qualities. These will feel surprisingly comfortable and allow new wisdom and the sense of knowing to free you to live from your heart. Allow your Soul to shine forth into the world, radiating those gifts that are uniquely yours. All is well and you are free. You Are Always Receiving God's Love Whether You Tune In or Not. We live in an Ocean of God's love. I was told that you can come to the Ocean of Infinite Abundance with a teaspoon, a bucket or a tanker truck, the Ocean does not care. The Ocean of God's Love is eternally available. You can take as much as you need. This is the Divine Substance in which we live, move and have our being. We swim in this Ocean like a little fish, so much a part of Divine Love that we forget that it is all around us. And yet if we only turn a small part of our attention toward this Infinite Source, our entire being is illuminated with the Light it radiates. What a gift! I spent years feeling alone, alienated and cut off from love. I tried to fill myself with many things that did not satisfy that deep need within me. I went after all that I was brought up to believe would make me happy. I found out very early that all that the world considered to be successful proved to feel very empty to me. It then took years for me to know how to live a spiritual life in a country that considered that to be less than important, in fact too weird, to even consider. And when I was trying to receive love and approval from outside myself, I experienced rejection and felt even more separate. The good news I discovered was that those experiences were my soul's requirement for sending me within myself to find the love that I truly needed. In this way I was lovingly coerced into continuing to focus on my spiritual practice, which then became a rich source of inspiration and deep abiding love. It seems as though many people are feeling bereft of the love they so want to experience in life. If sharing my process assists one person in opening to the Divine Nourishment available to all of us, the struggles that I experienced become more worthwhile. Receiving this message encouraged me and created a new deep awareness that even in those moments when I was not focusing on my spirit, God's Love was continuously working to keep me nourished. I know I can trust that Divine Love is available for me always. All I need to do is open my heart and allow it to be filled to overflowing. Thank you for holding me and blessing me with your Love. I AM now opening my receiving channels so I can fill my heart so full of your Love that it overflows into the hearts of all in the world. May I become more aware that your Love is always with me, guiding me and protecting me, even when I am not paying attention. With every step I take may I, and all of humanity, know truly within the heart that we are not alone and that Love always exists for us. And so it is. God’s love is the energy that permeates the universe. It is the essence in which you live, move and have your being. There is no time when you are separate from Divine Love, whether or not you are aware of this fact. Divine Love is always there for you. If you do choose to be aware that you are basking in the Light of the Universe in every moment, your life can change for the better. When you remember that you are always receiving God’s blessings, you know that you are supremely loved. No matter what you have done, or not done, you are loved. No matter how imperfect you feel, you are loved. You are the beloved child of a benevolent God who wants you to be happy, free, wealthy, and filled with love. This is what you deserve because you are you. You have come to this place and time to hear this message. You need to remember how much your life is worth to the Creator of all that is. Bask in this possibility for a moment. Breathe in the Divine Light and know, really know, how much you are loved. There is no one else in the world with the gifts, talents and abilities that you have. When you realize this, you can give thanks, knowing the way is now open for you to use your God-given talents and abilities to expand and enrich your life. For this you came to earth. You also came to earth to learn the lessons your Soul has chosen to learn. These lessons may feel difficult. You may see no way to accomplish your dreams. You may not even feel as though it is okay to have your dreams. Yet within you there is a spark of light that knows that you are always receiving Divine love. This love, which you are continuously receiving, holds the energy that can carry your dreams into the world. This love can heal all that causes you pain. This love brings hope and carries the seed of truth within its light-filled energy. It’s here for you now. Breathe in Divine Love. The Angels are messengers of God. They carry Divine Love to those who will listen and receive all that is available to them from the Universal Presence. So ask to receive this love. You are worthy to have the love of God in every area of your life. You are always receiving Divine Love, whether you "tune in" or not. Video - "Awaken & Expand Your Highest Divine Self ! Nothing can be done to you unless all the participating souls in the drama have agreed. You cannot die in a particular way unless your Higher Self has contracted to partake in that story. Very often the participants in dire situations and relationships are soul mates who have undertaken to teach each other important lessons. When your fifth-dimensional heart open, It becomes a joy and delight to serves others, your community and the world for the highest good. In fact it confers such bliss on you that you radiate light that can be visible to others. Because of this, service with joy is one of the greatest ascension paths. It attracts many aspirants. If you decide this is your spiritual journey, you will enjoy soaking in the teachings. Service with joy does not need to be the single focus of your golden ascension path. You may wish it to be part of your essence whatever path you choose.